Contracts for around 50,000 workers expire at the end of May at nearly three dozen casino resorts on the Las Vegas Strip and downtown Las Vegas. Tens of thousands of hotel and casino workers have voted to authorize a strike next month at dozens of casinos and resorts if contract agreements aren't reached before they expire at the end of May, the Culinary Union announced late Tuesday. Ninety-nine percent of 25,000 union members who voted at two sessions Tuesday favored authorizing a strike, the union said. The vote authorizes the union negotiating committee to call a strike any time after June 1, and does not mean that a city-wide strike will occur. But it could give leverage to the unions in negotiations. "A strike is a last resort. We want to come to an agreement, but the union and workers are preparing for a citywide strike if contracts are not settled by June 1,” Geoconda Argüello-Kline, secretary-treasurer for the Culinary Union, said in a statement. The properties that could be affected include those owned by MGM Resorts, Caesars Entertainment, Tropicana Las Vegas and other properties, the union says. Contracts for the culinary and bartenders unions at 34 casinos expire at midnight May 31, covering around 50,000 workers, according to Culinary Workers Union Local 226. They include bartenders, room attendants, servers, cooks and kitchen workers. The unions have proposed contract language to provide security for workers against sexual harassment, and the use of subcontractors and technology, among other issues, the culinary union said. "Over eight decades, casino workers in Las Vegas have been faced with the same decision: Show up or give up," Argüello-Kline said in a statement earlier this month. "You either show up and fight for what you deserve, or you give up and take whatever the company gives you." MGM Resorts International said in a statement Wednesday that "a vote such as this is an expected part of the process." "We are confident that we can resolve the outstanding contract issues and will come to an agreement that works for all sides. In fact, MGM Resorts and the Culinary and Bartenders Unions have scheduled talks for this week and next," the company said. Caesars Entertainment's executive vice president of communications and government relations, Richard Broome, said in a statement that "Caesars expects to reach an agreement with the Union on or before June 1 when the current contract expires." More than 40 million people are estimated to have visited Las Vegas in 2017, according to the Las Vegas Convention and Visitors Authority. In Clark County, gaming revenue was around $9.5 billion in fiscal year 2017, with more than $6 billion of that from the Las Vegas Strip, according to a Nevada Gaming Control Board report released in January (those numbers are before expenses are taken into account). The last city-wide casino workers strike in Las Vegas occurred in 1984 and spanned 67 days. Union members lost an estimated $75 million in wages and benefits, while the city lost a similar amount in tourism revenue, the Associated Press reported. Millions more were lost in gambling income. The culinary union also voted in 2002 to authorize a strike, but workers never walked out of their jobs because casino operators and the union reached agreements. 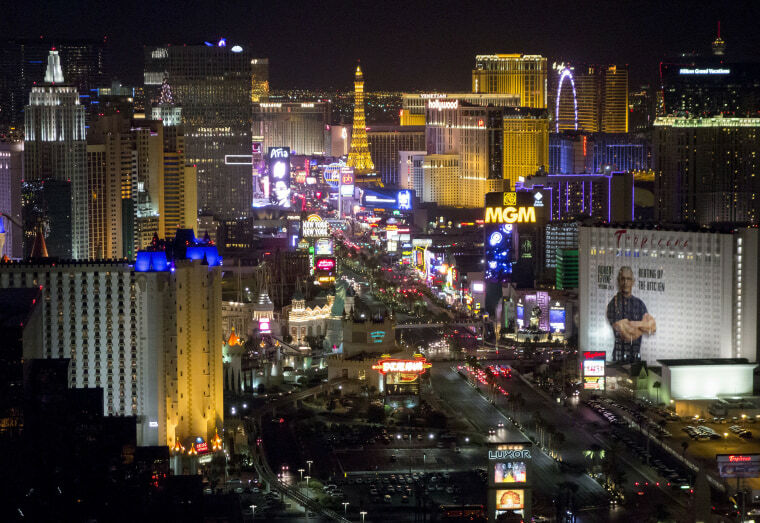 The gaming industry in Las Vegas has grown since 1984, meaning that more workers are needed to run the Strip and that if there is a strike it could have an even greater impact, said Ruben Garcia, professor of law at the University of Las Vegas, Nevada, and co-director of the university's workplace law program. "The industry is aware of the union's ability to wage a long strike, and that's of course something they probably want to avoid," Garcia said in a phone interview with NBC News on Tuesday before the vote result was announced. Union member Tamara Browning told NBC affiliate KSNV of Las Vegas last week that she was laid off last year after a computer app was used so that guests could order room service by text message. "Technology is replacing us. We need to fight for good customer service. And technology is replacing eye-to-eye contact with our guests and making them feel welcome," she told the station. Not lost on the union is the recent tax cut bill passed by Congress and championed by President Donald Trump, a tax law that has been criticized by some as giving too much to the wealthy. The culinary union says that "the union's economic proposal seeks to provide workers a fair share of the employers’ enormous anticipated cash flows and Trump tax windfalls." Nevada is one of more than 20 states with "right to work" laws, which prohibit agreements between unions and businesses that require that all workers join the union or pay union dues. Garcia said that despite that "this union is able to organize such that that’s not a barrier to their success." "The vote will be one other bit of evidence in terms of their bargaining power," he said earlier Tuesday. The Las Vegas area saw one of the longest job actions in the history of the nation, the Frontier strike that began in 1991 and ended more than six years later after a buyer bought the Frontier and settled with workers. The buyer planned to transform it but changed his mind. The casino was demolished in 2007 to make room for another planned project that fell through. "I'm here to show the younger generations that this is the way we fight to maintain our jobs, job security, health benefits and to gain a pay raise," Lewis Thomas, a utility porter at the Tropicana, told the AP. "This will be a wake-up call to let (the companies) know we are together, we are united, we are not separated."